IDJ: While many people in HK will recall Taikoo Dockyard and Hong Kong & Whampoa Dockyard or the Hong Kong United Dockyards as they were later known, few will be aware of Bailey’s Shipyard or the Cosmopoliton Dockyards which were quite substantial operations. The following account of W.S. Bailey & Co., often called Bailey’s Shipyard, is from Twentieth Century Impressions of Hongkong, Shanghai and other Treaty Ports of China, ed A Wright, 1908. Thanks to Richard McGeough for re-typing the original article. This well-known firm of engineers and shipbuilders was founded in 1897 by Mr. W.S. Bailey, who began business as a consulting engineer and importer of steam pumps and engineers’ requisites. 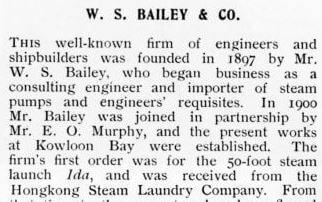 In 1900 Mr. Bailey was joined in partnership by Mr. E. O. Murphy, and the present works at Kowloon Bay were established. 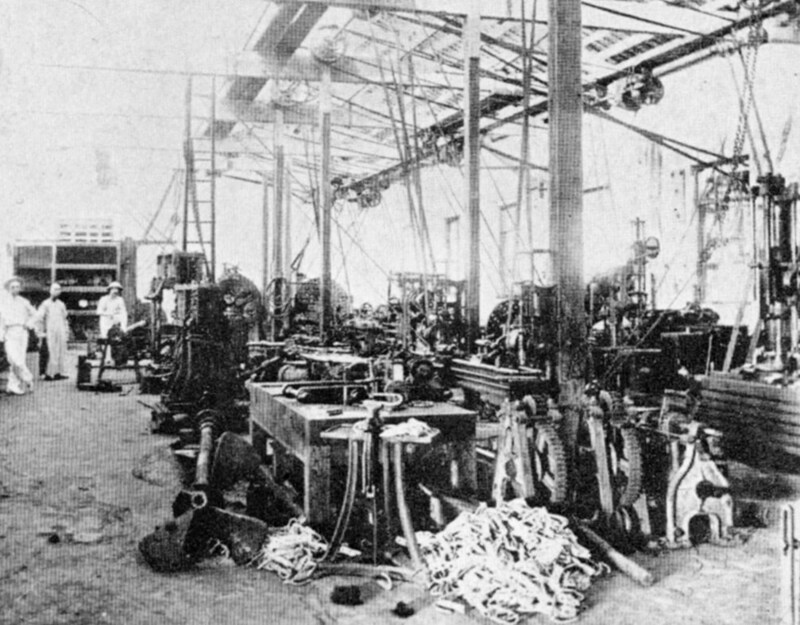 The firm’s first order was for the 50-foot steam launch Ida, and was received from the Hong Kong Steam Laundry Company. From that time to the present orders have flowed continuously and it has been necessary to make frequent additions to the premises and plant in order to cope with the increasing stream. The works now occupy about six acres, and have a sea frontage of 450 feet, so that eight vessels may be laid down at the same time. 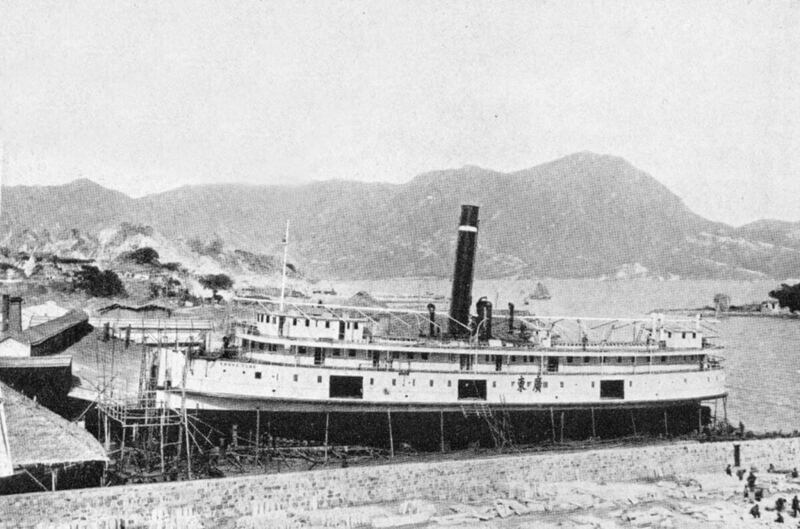 When established only three years the Company received the order for the Canton River steamer Kwong Chow (now the Kwong Sai), of 600 tons displacement and 200 feet in length. The boat was completed a year later and up to that date was the largest steel vessel built in the Colony. 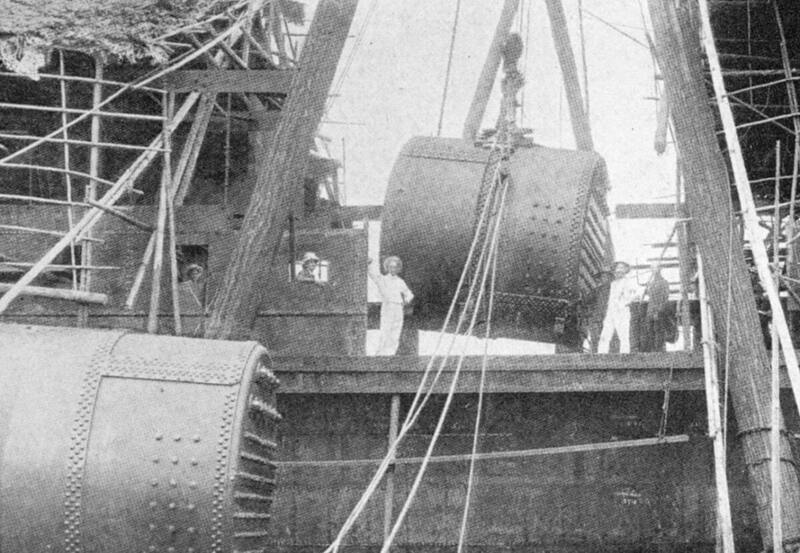 In 1905 the firm, in response to a repeat order from the same owner, undertook the construction of the steel twin-screw steamer the Kwong Tung, and while engaged upon this contract they also had in hand four iron barges, each of 600 tons capacity, for Messrs. Markwald & Co., of Bangkok, besides several smaller vessels and general work. At this time upwards of two thousand five hundred men were employed in the yard. Messrs. W.S Bailey & Co. have recently completed the steel cruiser Loong Sheung (Flying Dragon) for the Imperial Chinese Navy. On the occasion of our representative’s visit over a thousand men were at work, and there were on the stocks a steel twin-screw lighter being built, under Lloyd’s 100 A1 survey, to carry 825 tons deadweight at a speed of nine knots; and a steel oil barge 150 feet in length for the Standard Oil Company of New York. There were also fifty-two steel buoys under construction for the Manila Government. At the same time the firm were erecting large oil tanks at Haiphong and Saigon for the Standard Oil Company, for whom they had just previously completed a similar installation at Hongkong. In seven years the firm have turned out over eighty vessels, including stern-wheelers, light draught vessels, and motor boats, both twin and single screws. The senior partner, Mr. Bailey, was born in Dublin and served his apprenticeship was an engineer with the Australasian Steam Navigation Company, of Sydney, N.S.W. He came to Hongkong in 1890 and joined the Hongkong, Canton and Macao steamboat Company Ltd., in whose steamers Honan and Heungshan he served until he started in business for himself. Mr. Bailey is a member of the Institution of Mechanical Engineers, London. Mr. Murphy is of Irish parentage, and was born in Liverpool, where he served his apprenticeship with Messrs. John Jones & Sons. He was afterwards junior engineer in several vessels of the White Star Line, and arrived in Hongkong, as second engineer of the Abyssinia, in 1895. For the next five years or so he served as chief engineer in the C.P.R. liners Empress of India, Empress of China and Empress of Japan. Mr. Murphy is a Whitworth scholar, and vice-president of the Institute of Marine Engineers, London. This article was originally posted on 28th March 2014. I thought maybe Gleniffer was a renamed “Pride of the West” but I found a photo of the former and it’s not. PoW was about 65 feet, and was also built of teak. She was powered by a 5 cyl diesel engine. I remember the brass plate in the wheelhouse that said ” Built by WS Bailey in Hong Kong.1908. The reason it stuck in my mind was that my family were from Hong Kong and I asked my grandfather if he knew Bailey. He did, but not well. I may have another relative who was a marine engineer, and may have worked at WS Baileys back then. I wonder if you have any old HK photographs? Good to hear from you and to learn of your research into individual boats made at Bailey’s Shipyard. If you can find further information about your relative working at the yard I would be delighted to hear it – maybe even post it. And if you come across specific boats built at Bailey’s and can provide a few details and an image or two I can also post that. I found some info on the WS Bailey yacht I was looking for known as Pride of the West. She was brought to Vancouver and in 1919 was owned by William Farrell and named “Sheileena” I recall her brass builder plate having the year 1908, so I’ve yet to trace her first years. She had several more owners and different names including “Heather M” and “General Kitchener” ( 1939-1947 when owned by the Canadian Army ) before she became “Pride of the West” twice. She was apparently wrecked in 2010 after running aground. I’m still trying to get some photos.